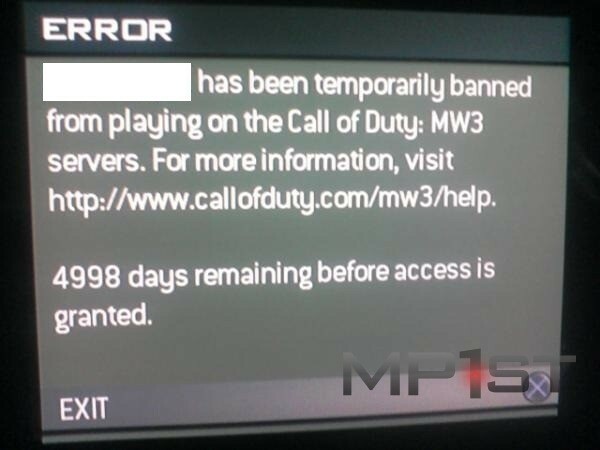 It’s oddities like this that always intrigue me, I mean it’s not like we didn’t know people were going to try and cheat in Modern Warfare 3 and that a system of temporary and permanent bans would need to be in place to deal with the cheaters. But now it turns out that there is no such thing as a permanent ban from Modern Warfare 3, nope if you want to glitch, cheat and abuse other players you can do so knowing that you won’t be permanently banned from the game. You may however receive a mere 5000 day ban which is around 14 years. So never fear little Jimmy you can come back and insult my mother again when you are around 25-30 years old.. I may possibly have moved on to another title by then though. The annoying thing however is we don’t know what this guy/girl did to get banned and the original reporting site, mp1st.com, didn’t say. Oh it may be worthwhile pointing out that if you are overly abusive in Modern Warfare 3 you may find yourself kicked off Xbox Live by the Microsoft Enforcement Team and that one really is a permanent ban.